I subscribe to KISS. Keep It Simple Stupid. More bees are killed from OVERCARE than undercare. Beekeepers are generally a VERY helpful group, but there are some few that can get defensive of their methods, and argumentative about methods they don't like. That is NOT what this site is about. I will never argue that my method is better than your method, that my bees are better than yours, or that the hives I use are better than the ones you have chosen to use. If everyone follows the same basic methods of beekeeping we would never learn anything, so I enjoy watching or reading about the methods others use. I will not say I agree with them, but I will certainly learn what I can from them. There are more methods to keep bees than you can shake a stick at, and for the beekeepers using those differing methods, they WORK, in THEIR situation, with THEIR bees, In THEIR climate. If those methods did not work they would no longer have live bees. SO!! Having said that, I ask you to keep an open mind as you learn about keeping bees. Beekeepers today have access to SO MUCH more information than beekeepers even ten years ago had. Use the resources available, watch and read all you can on cold winter days, or rainy summer days, (If your reading this then you have already taken that step. I applaud your desire to learn!) and then modify what you see and read to suit yourself! Join a club, and listen to what the members have to say. Ask them questions. Join forums, and ask questions, and once again, MODIFY what you see and hear to suit your own style and bank account! On my site, with my methods, and even in the forum I promote, you will NOT find anyone who puts down your method or hive type in a degrading manner. Criticism is constructive and helpful, not demeaning. It is MY opinion, that if what you are doing WORKS then I have something to learn from YOU! Are you confused after reading so far?? Don't be!! MANY of those confusing things can be set aside for later. It is very simple to get started. 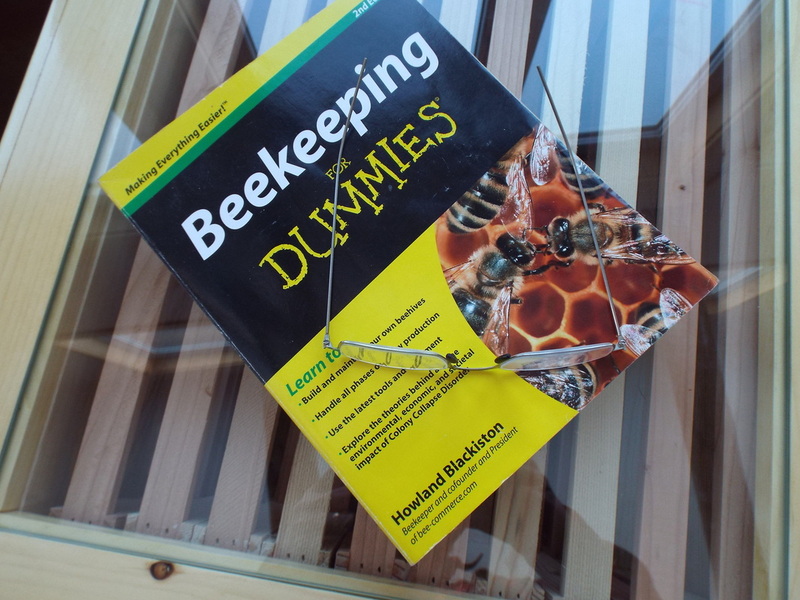 Get a start up book, Beekeeping for Dummies as posted in the main picture as just an example. The price of the book is worth it. It goes into detail about the simplest way to start beekeeping, without getting so in depth that a new beekeeper feels overwhelmed and confused. Read it! Then read it again! Then get on the internet, and look up Vids on how to keep bees or assemble a beehive. It isn't all that difficult once you see it done, and its even easier once you get the pieces in your hands. There is also as much or more information to be gleaned from the internet, if you are willing to sort through the rubbish to find the treasure. If you are easily overwhelmed by information, then I will state here on the internet that the internet may not be your best resource. I am going to take a moment to talk about that, skip ahead if you wish to bypass this part. I have stated it before, and it will be stated many times in my pages, that beekeeping is dictated by YOU. Meaning, your preferred method, it is your climate and location, so modify it to suit YOU and the type of bees you keep. How I keep bees is how I want to keep bees. They are my methods that work in my location and climate. What I do may not work very well where YOU are. Many times on the internet, these FACTS are overlooked by the person posting the information, and the person Reading the information. My advantage, was having spent a long time working with bees. When I got my own, I knew the motions, if not the reasons for those motions. So as I read, and tried to learn, a lot of things didnt make sense according to what I had been doing. So I knew some of that information did not fit.Take some time to insure the information you are getting FITS your situation, your bees, your climate. When you think you have a handle on everything, and your confidence peaks? THEN, the bees will do something you do not understand, and you will resort to asking questions. You will feel like a Novice all over again when you finally break down and ask for advice. I know the feeling well, so, when I offer advice, I TRY VERY HARD to make it clear that what I am saying is only my opinion, and I also try very hard not to get offended when someone counters my advice with their own. I don't know it all, and I never expect to know it all, I only have my past and present experiences to go with when answering questions. Remember, that MOST of those trying to help you with advice are much the same. Now, having put down the internet, I am going to do an about face and praise it. 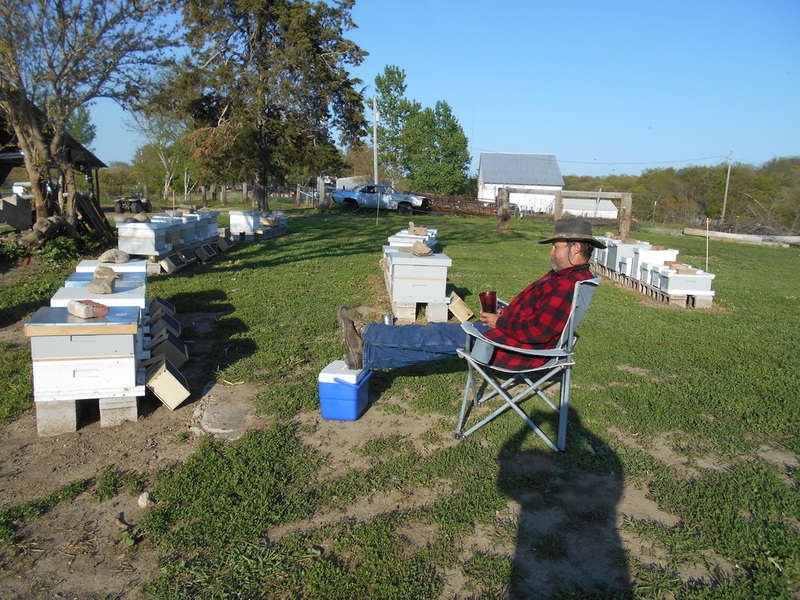 I think being connected gives us, as beekeepers advantages we never had in the past. I am old enough to remember beekeeping before Varroa, and before having a means of learning HOW to be a beekeeper. You learned from someone else if you could. Perhaps there were clubs back then? I was not aware of any. Having the ability to be connected to other beekeepers gives us the ability to work toward a common goal. Better bees, better queens. It allows us to ask questions, and learn. So long as you take all you read and see with a grain of salt, you should do quite well and be capable of learning the inns and outs without losing nearly as many bees. So start out simply, start out slowly, and get a handle on the "normal" aspect of beekeeping. My (unsolicited) advice to all beginners is to learn to keep bees using common equipment and methods before committing to any minority viewpoint. Most of the books for beginners I have posted above do exactly this. They start out simply giving basic guidance and basic problem solving. Start with the basics, learn the basics, and keep your bees in a basic manner. Once you feel you have a handle on those basics. From installing a package to feeding and treating, THEN, begin to advance. When you are confident in what you are doing, try a little more, doing a split or keeping a nuc. Generally speaking there are few emergencies in beekeeping. Seeing a swarm from your hive land in a tree qualifies as an emergency. Most other things can be thought about and dealt with in a calmer manner. In fact, NOT doing something is often the best choice. If you see mites, or your bees appear to have Nosema.. It needs to be dealt with quickly, but you do NOT need to flip on the lights and siren to rush back home and get the Fumagilin B or Mite away quick strips. That swarm on the other hand.. well, if I had lights and a siren they'd be blaring and flashing!!! CATCH THE SWARM!!!!! Many accept the inevitable swarm. You will have them, we all do. If you don't need another hive, pop the top on that soda (or beer), fold out the chair and watch the magic of thousands of bees flying about. Then look in the hive and determine why they swarmed, so you will be more prepared to stop swarming in the future. Learn.. always learn from everything that happens, good, or bad, and add that learning experience to your arsenal of knowledge. Murphy's Law is one of the governing factors of beekeeping. Confidence is quickly smashed by Old Man Murphy. I often think that he and Mother Nature have quite a romance. It doesn't rain and get cold until fifteen minutes before you pick up your package or queens at the post office. In almost every group you meet, in person, or on the net, you will meet those who DEMAND bees be maintained in a specific way. Their "way" is the ONLY way to start. Some BELIEVE bees should NEVER be treated for any ailment, or even mites. They dont need to be winterized or wrapped!! It is UN NATURAL!! Of all the beliefs, I find these to be some of the worst for a new beekeeper. I personally guarantee that your bees will die if you try to start beekeeping this way. Give yourself a chance to succeed in that first year. So MANY new beekeepers simply give up when their bees die. Lets not be a part of that group, were going to do our best to get those bees through their first year, give YOU some confidence, and then, after that, start stretching your wings and trying different things if you desire to do so. So, On to basic beekeeping and setting up to begin keeping bees. Lets start with a video on Hive basics, This video is intended for folks who have not previously had a beehive, to help explain a few things about them. MY recommendation, is to BUY (2) two hives. Two hives gives you several advantages. Two hives gives you the ability to compare. If one hive is full and strong, and the other is weak, it will be easy to see the difference between the two. Having two gives you resources. If one of your hives is weak, you can swap positions, so that the field bees return to the weak hive instead of the strong. You can take a frame of brood from the strong hive and give it to the weak hive. Two hives allows you to fix a queen less situation. In the event one of the queens is a dud, or perhaps is accidentally harmed while doing an inspection, you will suddenly realize there are no eggs, and no queen! You can transfer a frame of eggs from your other hive so that the queen less bees can raise a new queen. Two and a Half Hives with Larry Connor, from Brushy Mountain Bee Farm. So, why not just build my own hives to start out? If you have the tools and the skills, and can follow directions, there is no reason you can't! BUYING your first hives gives you a pattern, and exact dimensions to BUILD your own equipment in the future. Having them on hand answers questions you may have about those directions. Money well spent! Three hives would be better, and I do not recommend more than four the first year, as it can get overwhelming while you try to figure everything out. Read a lot. Use the Net! There are a lot of resources available, including videos on most everything you have questions about. As time passes I will be adding vids here as well. That depends a lot on you, and your situation. Good pine boxes will last a few years. Cypress or ceder will last a LOT of years. There are a lot of suppliers, check their prices, AND the shipping costs. Some offer free shipping if you spend a certain amount, others will have specials where shipping is free. Again, this depends on you. Do you feel comfortable putting the boxes together? Making them square? Assembling the frames? If you are even just a little handy you can likely do it, and save a bit of money. Do you have a Brad gun or a staple gun? Do you want to assemble 80 frames driving those small nails in with a hammer? If that thought doesn't concern you then go for it! For those who are a little LESS handy, ordering everything assembled saves time, and probably money in the long run. A friend once told me about some folks who called him and asked for advice on their new hives. He invited them over, and they showed him what they had built. He said the boxes were very well done, but as the gentleman began trying to pull frames out, they were falling apart in his hands. He took the time to start his compressor, get the glue and nailgun out, and showed them how to put the frames together correctly. You may laugh, but that couple did the RIGHT thing asking an experienced Beekeeper for advice. Had they not, it would have been a disaster when they tried to hive their packages. Or worse, tried to pull frames to inspect them. Once again, let me warn you, that on the NET, your going to be told your doing it all wrong, no matter HOW you are doing it. Ignore the worst, and pay attention to the constructive criticism of those who ARE trying to help. Find a good forum to ask questions and avoid a lot of that stuff. Link at the top of the home page to a forum that will never make you feel like an idiot, even if you don't know what those plastic sheet things are that go into the wooden bracket things. Someone who lives in a similar climate to you will have better advice. Arguing with someone who lives in Texas about winterizing YOUR hives in Montana is pointless, as is arguing with someone about Feeding, when he has 3000 hives and you have four. WATCH for those who give advice based on YOUR location, and watch for those who take into consideration different climates, types of bees, Methods, and even AGE of the beekeeper, and you will find they are likely giving better advice. Standard configuration is two ten frame deep hive bodies, and two medium supers. Deep hive bodies are traditionally the brood chambers, where the queen lays eggs and the brood is raised. The Medium boxes/supers are where your bees will put the reserve honey they collect, this will be the honey you steel from them when the time comes. How strong are you? How is your back? What is your future goal with your bees and hives? I ask these questions, because it may make a difference in what you order, or build. If your young and healthy, and only intend to EVER have three or four hives in your back yard, then maybe you don't want to use medium boxes/supers at all, maybe you prefer to use ALL deep hive bodies. A deep box filled with honey can weigh 90 to 100 pounds!! If lifting that much doesn't concern you, then using all deeps may be the way for you to go. If you intend to have 100 hives, consider how many of those 90 pound supers your going to be carrying around! Using boxes that are ALL the same size allows you a lot more flexibility. When it comes time to winterize, and you find that your bees have not stored much honey for the winter, perhaps because the fall nectar flow was bad, you can take a frame (or several) of honey from your freezer, (that you saved just in case this happened), thaw it and slide it into your brood chamber, insuring your bees are well prepared for winter. If your boxes are deeps and your supers are mediums the frame will be too short. The bees will fill that space with comb, under your frame. I prefer to use all ten frame medium boxes. A medium full of honey is 60 pounds, give or take a few pounds. I can lift that easily, and hope to be capable of doing so for many more years. I use three medium boxes as brood chambers, they equal the same space as two deeps. As stated above, it allows me to swap honey into the brood chamber if needed. It also allows me to steel one of last years honey supers to use as THIS years brood box when I get an unexpected swarm call or cut out. THUS allowing me time to get another box built. Some folks prefer to use 8 frame deep boxes. They claim brood builds faster, and the bees utilize all 8 frames more efficiently, they are also lighter than ten frame deeps. I know many who use 8 frame medium's exclusively so they are easier to handle / lighter. I do not follow Mr. Bush's philosophies exactly, but I DO believe he has some good ideas, but please remember that he is managing a couple hundred hives. So when he says to let the bees re queen themselves, he will not be out of honey production for the year if the new queen fails, or if he loses a hive, or ten, or even fifty. He would have the resources to replace all 50 losses in a single spring. In talking with other new beekeepers, it has come to my attention, that they started out using DEEP brood boxes and medium supers because that was "standard" and they wanted to learn the "right" way before they tried anything "different".. I applaud the thinking, but the choice of using Deep or medium hive bodies will make little to no difference in the "basics" of beekeeping. Do NOT use deeps, or Mediums because you think thats how you should start beekeeping. Use deeps, or mediums because they will be the most convenient way for you to CONTINUE beekeeping in future years. If deeps suit your methods, style, and health/strength better then START with deeps. If Mediums suit the way you wish to keep bees better, then START beekeeping with mediums. Nothing about the box size will affect the basics of learning beekeeping in any way. The bees will not care! I know beekeepers that use shallows exclusively because they cannot lift much, and their bees do fine. The choice being made is NOT the end. You can change to a smaller, or larger box if you decide to do so in the future. I often inherit deep boxes, and have to convert them to mediums. Each spring when I rotate, I simply remove the bottom deep and add a medium to the top. It really is that simple, so all you need to do is think about it, and make the choice. If you decide it wasnt a good choice later, it can be fixed. I often hear that using mediums is more expensive, because it uses more equipment.. basically, one extra box and ten extra frames per hive..
One 8' long board will build one hive box.. for a deep, it has to be a 1x12x8 and costs $8.46. A medium box uses a 1x8x8 board, and costs $4.69. Three medium boxes cost $14.07. Two deep boxes cost $16.92. So the cost factor for the boxes doesn't pan out, its $2.85 cheaper.. But you will need ten extra frames.. Deep frames assembled cost about $3.10 each. Medium Frames assembled cost $2.79 Each. So 20 Deep frames are $62.00 and the 30 medium frames cost $83.70... So frame cost comes down to just over 20 dollars MORE. Minus the three dollars savings on the wood... = $17.00 Seventeen Dollars... So, yes I have to agree that it is more expensive to use all medium equipment. The benefits more than make up for that cost to me. You will have to decide if the those benefits are worth the difference to you. I am also of the opinion that if $17.00 is going to matter to you, or $34.00 if you have two hives, or $170.00 if you have ten hives etc, then you should probably not consider beekeeping as a hobby. Decide early what you think will benefit you the most. Then order your hives based on that decision. I prefer foundation-less frames in my medium boxes, but that's not the easiest way to start out. If your mildly handy save a bit of money and get the un assembled wood frames with plastic wax coated foundation. If your not even mildly handy get the plastic one piece wax coated frames, or the wood frames with plastic foundation already assembled. The one piece all plastic frames AND the assembled wooden frames will save assembly time and effort, but will cost more. I have found that the one piece plastic is too flexible and too prone to breaking as it gets older, for me to continue to use it, but when just starting out, it works well for those first two or three critical years as you learn. Once you get a grip on everything going on with the bees, THEN you can start adding foundation-less frames if that is how you wish to proceed into the future. If you are not currently overwhelmed, and are, like I am, a determined individual willing to deal with issues and problems as they arise, then go ahead and give the foundation-less a try. If this is your decision, then I recommend that you still use some frames with foundation to break up the big open space and help get the bees in line with the frames. I use the PF120 small cell all plastic frames from Mann Lake to help guide bees in new hives when I have no drawn comb. I have around three hundred of these. The bees usually go for the foundation-less first, and will in fact draw out MOST of those frames before they ever touch the plastic. This allows me to pull the plastic, and drop in foundation-less frames before they ever get drawn. The bees get some guidance, or at the very least make any mess slightly easier to clean up, and I get to pull the plastic frames to re use next time I am short of drawn comb when starting a hive or nuc. More information on frames can be found in the do it yourself section under the Frames tab. OK! You have decided what you want to use. Ordered your hives, painted and assembled them! Yes, they are made of wood and it needs to be protected from the elements. I use cheap paint, you can use whatever you desire for an exterior grade paint. The paint needs TIME to cure and dry, as well as air before you put your bees in. Why cheap paint? Why not buy the BEST paint for the hives? Because your going to be jamming your hive tool in between those boxes to pry them apart, it WILL chip the paint, and they will need touched up or repainted. Having to repaint, or touch them up often sort of negates the benefits of GOOD paint, and it also means you will be buying MORE paint to do those touch ups etc.. Paint the exterior of the boxes, NOT the interior. The bees will seal the interior themselves. Do not paint the inner cover, and do not paint the bottom board area that will be covered by your boxes. I know beeks who paint their entire bottom board, and seem to get along well doing so. I understand why they do it. Moisture will collect there, and rot out that bottom board in just a few years. I do paint in a few inches from the entrance, but prefer to limit the paint the bees will be in contact with. Hive components are disposable! When they are no longer practical to repaint or repair, build or buy a new one to replace them! Better yet, spend the winter downtime building a few extras. You never know when your going to get a call to collect bees, or find swarm cells being prepared in one of your hives! Finding swarm cells and KNOWING you need to split, and split NOW is much more enjoyable and relaxing when you already had the extra equipment waiting. I have seen hives painted from top to bottom, inside and out.. Bees will chew the paint, and they will still seal the inside of the box with propolis painted or not, so its not only a possible hazard to your bees, its a waste of paint. Typically hives face the South-East. South, or the East. Allowing the morning sun to hit the entrance sooner, and get the bees out of bed and flying sooner. It also has the benefit of keeping the entrance away from the prevailing winds, so rain or snow are not driven into the hive by those winds. Here, we don't get snow measured in FEET, we get inches at a time normally. Two or three inches isn't a big deal, until the WIND here is taken into consideration. Most times my yard is bare, not an inch of snow on it, but behind my house there will be an 8 foot snow drift. Wind breaks are good, but make sure that your hive will not be positioned behind that wind break where that 8 foot drift will form. Consider mowing around your hives, leave room to get around them. What do you want to set your hives on? Cinder blocks, Bricks? Pallets? Perhaps you want to build a nice wooden stand, or pour concrete? The choices are many, and each have their pro's and con's. I like to have my bottom boards on stands that raise them up 10 to 12 inches. That height makes the working height right where my back is the happiest. Some like them CLOSE to the ground, so those pollen and nectar laden bees returning from the fields can climb up into the entrance if they miss the landing board. Some like the hive up off the ground to limit problems with ants and other pests, Including toads, Possums, and skunks. They love to sit at the entrance and feast on bees. A skunk will actually scratch at the entrance, getting the bees to emerge so they can be eaten. SNOW can be an issue as well. Too close to the ground, the entrance will be constantly blocked. The warmth of the hive will melt the inner layer of snow, and it will become a wall of ice. If you have a top entrance this is less of a problem. Please see more about Winter survival on my Wintering page. More consideration on the stands. Tilt the base toward the front slightly. 1/2 an inch give or take a little is acceptable, so any water driven into the hive, or condensation formed in the hive can run out the front, rather than pooling in the back. LEVEL the hive side to side. This is MOST important if you ever decide to use foundation-less frames. With no foundation, the bees will build their comb perfectly straight up and down, no matter which way the frame tilts. It is less important with foundation, but level is better. Consider the weight of a FULL hive of bees with two or three supers of honey on them! If you plan to put two or more hives on each stand, then that needs to be considered as well! You will be working your hives from the back. Standing in front of a hive annoys the bees, either those traveling back and forth, or the guard bees at the entrance. Always work the hives from the back. Take that into consideration when placing your hives. Make sure you leave enough room behind them so that you have access, so that you have room to lay the telescoping cover down flat. Why? Because when you remove a box to look in the next box down, you will be setting the removed box on that telescoping cover at an angle. Less contact points less area to squish bees if the box is set flat side to corner of the tele cover. So decide what you will do, and get to work! Preferably the fall before you need them, and no later than January! If you don't get them ordered soon enough, the bees you CHOOSE may be long gone, and you will have to settle for packages of bees that came off the Almond pollination. Consider ordering VSH, Minnesota Hygienic, or survivor stock. It will make your life easier when it comes time to check / treat for mites. Talk to the Queen breeder! Many of the more reputable breeders Import breeder queens. Even if they are raising queens in Georgia, they may well have genetics FROM your area, or an area with similar climate. So don't rule them out based ONLY on their location. A little searching will find you what you seek. Packages, or Nucleus hives from someone nearby. Joining a local beekeeping club will often pay for itself a hundred fold in finding local bees, and even a mentor to help you get your bees started. IF you can find Nuc's, they are a bit more expensive, but provide you with bees that are already working together. You do not need to introduce the queen, and you start out with frames of drawn comb, eggs, and brood. A Nuc will be ahead of a package by a month!! If you are considering a Nuc. Make sure that Nuc uses the same size frames as you chose for your hives. TRY to get at least a four frame Nuc, five is preferred, occasionally you can find 8 frame medium Nucs which for all intents and purposes IS a well started hive. You can sometimes find 3 frame nuc's. They work, it just takes a bit longer, and they will need to be advanced in a larger NUC box to at least five frames unless that three frame Nuc is BOOMING with bees. On occasion you can find complete hives for sale. It may seem a good deal, and often IS a good deal, but you need a bit of experience to know what you are looking at when inspecting a hive you intend to buy. I personally recommend starting with the package or Nuc until you are more familiar with the problems you need to look for. Isn't a nuc just a smaller hive? Why is buying an established hive different than a nuc? The nuc is typically started the summer before and overwintered, or, they will be started THAT spring. A hive is an established unit that could bring with it the problems of several years, rather than being newly established. It is also my experience, that a nuc will build up faster than even an established hive when given the resources to do so. OH LORD!!! Your excited and terrified all at the same time!!! Pictures of us hiving bees at the bottom of the page. I started with 4 hives. By the time my bees arrived, I had watched every VID, and read every article I could find about hiving them. I had read my Beekeeping for dummies a dozen times cover to cover.... I was READY! I went to the post office to pick them up, and gave the packages a quick spray of light syrup before I loaded them in the back of the car. Drove them home, and put them in the garage where it was shaded and cool to wait for the afternoon. I sprayed them lightly again about two hours later, and hived them in the evening when it was a bit cooler. This also has the advantage of pulling them all in as darkness falls so they get used to their new home. This is assuming you have previously set up your hive at its permanent location. 1. Open hive and remove 4 to 5 frames from the hive. 2. Mist/spray the bees and Open the package, remove syrup can and queen cage. Put the plywood cover back over the hole. Inspect the queen to make sure she is alive and well. 3. Attach queen cage to the frame. This can be by pressing into the wax, using a rubber band, or a thumb tack/staple through the provided strap. Make sure the screen side is exposed so that the bees can interact and feed the queen. 4. Lightly mist the bees again if necessary. The syrup should be thin so it will mist when sprayed. This will cause them to clean themselves up, and it will also keep them from flying when you dump them in. 5. Dump. Upend the package over the opening where there are no frames and gently shake it back and forth, dumping the bees from the package into the opening. If necessary, thump the package on the ground to get the bees to release their grip on the top, sides and screen wire. Dump as many bees as possible from the package into the hive. 6. Gently spread the bees, with hand or hive tool so that the frames can be replaced, and gently allow those frames to settle back into place. 7. Close the frames up as much as possible, and center them in the hive box. Place inner cover on the hive. 8. place 1/1 syrup on the hive. Typically, I like to use a mason jar over the inner cover hole. If it gets cool at night, the bees can still reach this source of food. If you use a boardman style feeder, they will not be able to access it if it gets cool. Finishing up; If you use reversible inner covers, place an empty medium hive body on top and cover the syrup with the telescoping cover. If you use a commercial inner cover, place a shim, and a medium hive body, or a DEEP hive body on top, and cover with the telescoping cover. This will prevent the syrup from leaking into the hive when the sun hits the exposed jar. Last, and MOST importantly.. you need to bring a chair, and have a seat to one side of the hive entrances. Preferably also a cooler, or a small table where you can rest your beverage. Make sure you cover your beverage to keep would be alcoholic bees out of it. Alcohol is bad for your bees! Swallowing alcoholic bees is bad for you! The Vid below is me installing packages. Watch the vid, then read the written instructions. If you still have questions, either EMail me, or go to WWB Forums to get a grander area of expertise and experience with the answers that may be better for your situation and location. Like most things beekeeping, there are dozens and dozens of vids on hiving a package of bees besides just mine. You should have watched each of them, and already decided HOW you wanted to proceed. IF the queen has attendants in her cage with her, do not put the queen cage between the frames candy side down. If an attendant dies, she may well be blocked into her cage, unable to escape. Put the candy plug side UP or to the side. I prefer to put them to the side, with the screened side of the cage down for easy access to the bees that will be feeding the queen until she is released. IF after three days she is not released, pull the cork out of the other side of the cage to direct release her.. WARNING! Do this ON the top bars. In the event she comes scurrying out, she will be less inclined to go flying off over the horizon. There is NO FEELING as awful and helpless as watching your queen vanish in the distance. As seen in the vid, this is how I mount my queen cage. Keep the cage to one side or the other from the center hole on the inner cover if you intend to put a jar feeder over it. I try to start packages with 4 frames of drawn comb. If you do not have drawn comb rubber band the cage in this position, or with the candy plug hole UP, and the screen facing toward the center of the hive. Putting the cage down between the foundation allows you to close the frames together so all ten frames fit into the hive. These bees are going to want to build wax. They will construct quite a bit of bur comb. My method helps keeping them focused on building wax where it needs to be built. Does that mean you cant do it any other way? Not at all!! This is just how I do it, and why. Remove a few frames and dump the bees in... seems rough, but a bee can fall from a thousand feet, land in the grass and walk away. Is this any more stressful than re opening the hive the next day to get the transport box out of the hive and re arranging the hive box, AND removing the extra hive box you used for a spacer? My personal opinion is no. They have been shaken into boxes with bees from other hives, introduced to a queen they didn't know, shipped on a truck or trailer hundreds or thousands of miles, distributed and hauled to their new home, and then shaken into a hive.. Enough already! GET them into the hive, and then LEAVE them alone! Check the queen cage in three days, pop the cage out, close the hive and LEAVE them alone for at least a week. TWO if you can force yourself to stay away that long. In two weeks you may have capped brood, and should have eggs and larvae. New comb being built and bees settled in to get the job done. The stress level will be going down. MUCH better than disturbing them even one more time than necessary once they start to settle in. Just my opinion. NOW, you go mix a drink, grab your most comfortable lawn chair, and go sit to the side of the entrances, and watch your bees orient to the hives. If they land on you, look them over and say Hi. It gives you the chance to look at them up close and personal and get better acquainted. They wont sting you. So just ENJOY! Bees DIE when they sting. They don't WANT to sting you. In order to make them sting, you have to give them reason. Disturbing their HOME is a good reason. (Shaking them about in a sealed box) Sitting on a bee is another good reason. Hurt them, or threaten their home, and they will sting, wouldn't you sting if someone tore your home apart and hurt your family? Someone knocking on your door and treating you with respect is not likely to anger you. Each time I have installed packages, I have done so in a t shirt, no gloves or veil, and I have never been stung, until I installed these latest packages. I usually draw the line at three stings and put the suit on, this time I was stubborn... and paid the price, as did my wife. ONLY you can decide to wear, or forgo protection. If you KNOW you are NOT allergic to stings, then by all means, try it without protection. If you are not sure? I suggest a veil and coat if not gloves.. If you get stung on the hand, get the gloves on and see how you react to that one sting before allowing more. If I get the stinger out quick, there is little if any pain and no swelling. If I miss the stinger, or cant see it etc, I do swell slightly and will be itchy after a couple of days. SCRAPE the stinger out. If you grab it between your fingers and pull it out, you will inject the venom from the sack into your skin, and you may as well have just left the stinger in. You will quickly learn to hear the difference between a bee flying past, or landing on you that is not angry, in comparison to the sound of a bee hell bent on driving you away. The sound of a bee that is angry will be higher pitched, and its movements will be swifter. Learn the warning signs and heed them. Put on a suit if they are being uppity. Once I was done shaking them about, I was fine sitting and watching them as I sipped on my drink, and even walking about among them. It will take them time to get organized, and get comb started. Feeding them 1/1 syrup gives them the instant resource to build that comb quickly. I have heard that inspecting too often too soon MAY result in the bees killing the queen. I have yet to have this happen, but I do TRUST the sources that claimed it possible. If I had only known then what I know now! Queen excluders; will be talked about in the SPRING section. This is something you cant overlook. What are you going to do with your unused equipment? Where will you store the honey supers for the winter? If you only have a couple of hives it will not be as much of an issue. Two or three supers extra per hive can fit in a corner of the garage. Bee suit? Smoker, Smoker fuel. Foam insulation for the top of those hives in the winter. Wrap for wintering the hives. Hive tool... what about Wax moth? Got crystals to keep the comb in those supers usable? What about an extractor or just the crush and strain extracting equipment? Will you melt your cappings down and refine the wax? You will need dedicated equipment for that as well. If you are going to have more than a couple of hives the extra equipment will add up rather quickly. You will be cleaning that equipment to prepare it for use each spring. Trust me when I say you do NOT want to scrape propolis from the boxes and frames in your driveway. It will still be there 4 years later. It will stick to your boots, and your wife WILL instantly deliver a LARGE litter of kittens when she sees it on her floor or carpet. Make sure you prepare a spot to keep your gear, as well as to clean and re paint your gear. Pictures of hiving packages below. In some of the earlier pictures we are not wearing any protective gear, and no stings were taken by anyone involved. In the next couple of years I came to accept this as normal. The latest packages were anything but normal.. Weather? I tend to think it was because of the close proximity in which I hived them. A LOT of bees flying about, and it was not until I was into my fifth or sixth package that they started to get a bit testy. No, don't get a flashlight and go running out there.. RELAX, go back to sleep.. In the event you did forget to remove the cork you can pull the cork from the other end of the packages after the three days are up and let the queen walk out, down between the frames when you do inspect. If you forgot the hole? She will likely be released anyhow when you inspect. If not, see above. Gently pop the cork from the non candy side, and put your finger over the hole. Set the corner of the cage on a frame with the hole opening down toward the gap between the frames and remove your finger. Be patient and calm, watch her climb out, usually she scurries directly down between the frames. If you realize you placed the screen against the wax or foundation, go out in the morning and fix the situation. STILL not a flashlight emergency. The lady down the road calls and says she has a SWARM in her tree? OK.. NOW you flip on the lights and sirens... THIS is an emergency!!!! You do have a kit put together to go catch a swarm right? I am sure this will get me in some hot water, but I am going to say it anyhow. The first four packages I ordered started well, and built up very well. ONE of those packages superceded in the first week the queen was laying. TWO of them superseded a few weeks later. In their first winter, three of the packages starved to death, inches from food. ONE survived the winter by the skin of their teeth. That colony died the following winter of starvation, inches from food. I did not order more packages after that. I split other hives from local stock, cut outs and swarms. Those hives ALL survived the winters using the same methods I tried to winter the packages. This spring, I installed TEN packages. All ten stayed in their new homes. Three of them superseded in the first week. Over the next six weeks six more of them superseded their queens. Three of those supersedures failed, and they had to try again. At the current time, I only have two of the original queens left. Two of the packages with superseded queens JUST did not grow. They have brood, a decent laying pattern, but the amount of brood was small. I gave them frames of capped brood and nurse bees from other hives, but they still refused to grow. I combined those hives with stronger hives so they would be ready for winter. By contrast, I also bought nucs, and I purchased queens from stock that has proven themselves overwinter. Ten local nucs with dark and tiger striped queens, rather than golden queens. Of the ten nucs, ONE of them superseded. Of the five queens that I purchased. I still have four of them heading hives. The fifth is a daughter of the purchased queen. The queen in that hive Vanished.. why? Maybe I killed her or lost her during an inspection? I honestly do not know. What I do know, is that my struggle with the package bees, was three times the struggle I had with ALL of my other hives to get them to this point. Is my experience typical? Are my methods to blame? I honestly do not know. What I do know, is that if MY methods are at fault, then there is a lot of difference between the golden bees and all the other bees in my yards. I have not had to struggle with those other bees like I did with the package bees. Why did the first packages I bought die in the winter? I have been told in an unfriendly way, that I did not winter them correctly. But Every single one of my other hives survived the winters. ALL of them! The ONLY dead outs I had were the golden queen hives, and they were all wintered in the same manner. SO! What it come down to for me, is that "IF" I did not winter them correctly, then I do NOT want them. I do not want to have to take more extreme measures to winter my bees. I do not want to have to purchase more insulation for the hives, or store that insulation. I do not want to have to work harder. I do not want to have to go out in the -20 temps, when the wind is blowing 20 to 40 mph across the plains to see if they are alive or not. I do NOT want to have to stand in my warm living room, looking out at the hives, and WORRY that they are dying. The other hives I have GIVE me that confidence. With those hives. I can relax, and feel assured that when we get a 45 degree day in late February or early March that I will find the bees taking cleansing flights. Even if those two package queens I have left come through the coming winter with flying colors. I am still not impressed by the odds. Does that mean you should not get packages? Absolutely not. Please DO buy packages, install them, get them going..
As an example.. you get your packages around May 5th.. install them, feed them, watch them. A month or so later, find a local, or northern queen, A queen with a good background of resistance to mites, and replace the queen that came with the package. In a few weeks, the brood emerging will replace the brood the original queen produced. Your bees will be more suited to COLD weather, and possibly even have a greater resistance to the varroa mite that plagues all of us.